Join Today! It takes 5 minutes. Download our easy-to-complete PDF application form here. Fill it in and email it to us. Done! • Protects your EHC lifetime maximum. • 50+ Benefits – Nursing, legal, etc. Download our easy-to-complete PDF application form. Email us the completed form or mail it to our office or FAX it to 604.871.2265.
Who is eligible to join BCRTA? There are two types of membership: Active and Associate. You are eligible to join BCRTA if any of the following describe you. You reside in BC and receive a pension from the Teachers Pension Plan of another province. You are currently employed in education, and when you retire will qualify for one of the categories above. 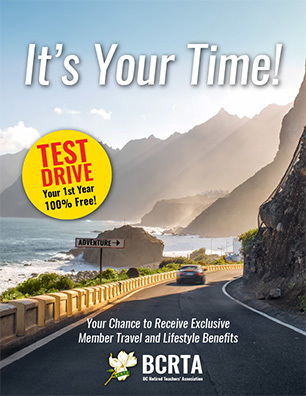 For a limited time, BCRTA is offering a one year free “Test Drive” for new memberships. After your first free year, regular annual membership is just $40. What are the benefits of BCRTA membership? As a BCRTA member you will have access to a wide range of extended health plan benefits, consumer and travel discounts, and many retirement resources. You will be part of an organization that stands up for education, for seniors, and for pension rights. You will also find great opportunities for learning experiences and new personal connections. I see that the BCRTA office is in Vancouver. What if I live elsewhere? BCRTA has local branches all across the province, and events happen close to you, including social gatherings, benefits seminars and more. You are warmly invited to join your local branch for a very small fee (generally under $10 per year). The BCRTA leadership team includes representatives from all regions of BC. As a BCRTA member, you will be eligible for the full range of benefits offered by our benefits partners no matter where you live in BC.